Steep yourself in the mountain and wine culture of Mendoza during a 3-night tour from Buenos Aires. 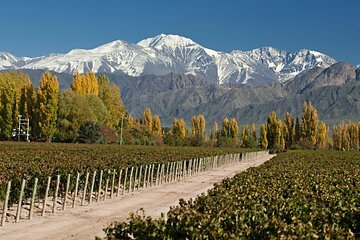 Hop on a plane in Buenos Aires and arrive in Mendoza in under 2 hours to appreciate its stunning mountain views and tasty wine. Get easy access to the region's wineries and the picturesque Aconcagua Provincial Park. See Los Penitentes, Puente del Inca, Potrerillos and Aconcagua, the tallest peak in the Americas, during two day tours. Taste Mendoza's most famous varietal, Malbec, and learn about its production. Round-trip airfare, nightly accommodation and daily breakfasts are included.